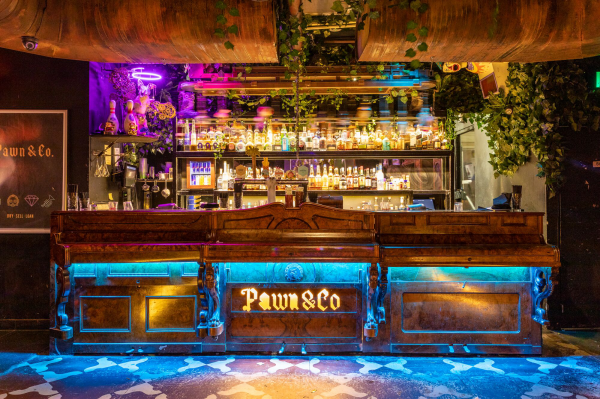 Pawn & Co is the first bar in the world where everything you see is for sale, from the stool you're sitting on down to the glass you're drinking out of. 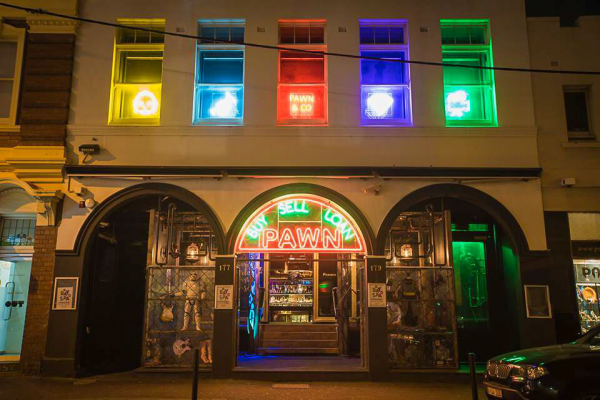 The second generation Greville Street address gave opportunity to evolve the pawn/club concept (''buy, sell, loan dance...") and reward a loyal clientele of drinkers, dancers and expressive social minglers. Initially a bare, two-level warehouse space, the question was how do we transfer the concept/brand to the new location. 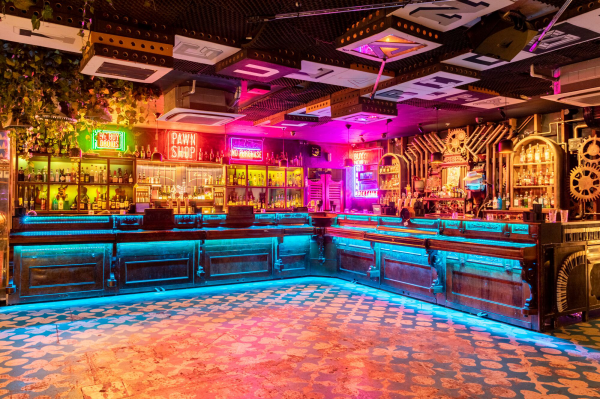 This was achieved through carrying familiar hand painted artwork, retro colours and textures that create warmth and intimacy from the original venue, introducing them to a futuristic motif of experiential, interactive design features, neon lighting and bespoke finishes. The result is a themed pawn shop of all ages from the past, present and future. 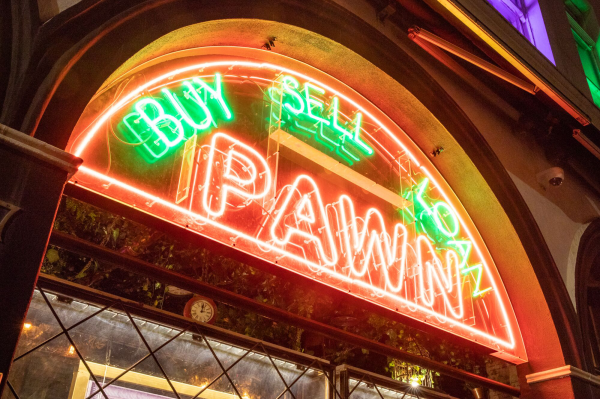 Tucked behind the neon-lit, arched exterior, street facing pawn cabinets and iconic oak front door. To elaborate on the original concept by designing an interactive and dynamic space that is functional across a range of entertainment uses while maintaining familiar brand identity. A slightly off-chapel location demanded the offering be compelling and serve as a self-perpetuating marketing concept that generates online and offline conversation. The creative focus on up-cycling, repurposing of pre-loved objects, textures and surfaces was driven by the slogan; Buy, Sell, Loan. 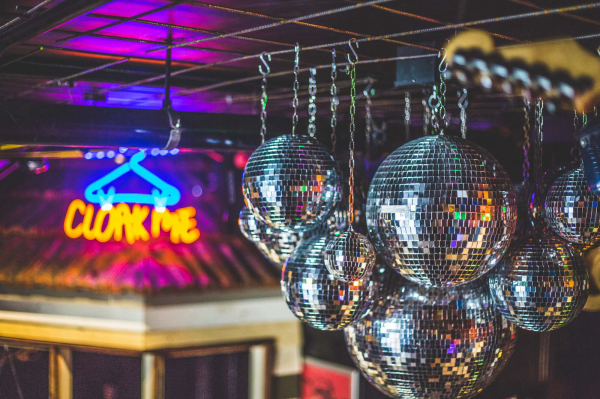 A fire in an adjoining premises forced the relocation from our original Chapel St home with limited options given the scarcity of suitable late-night licenses. 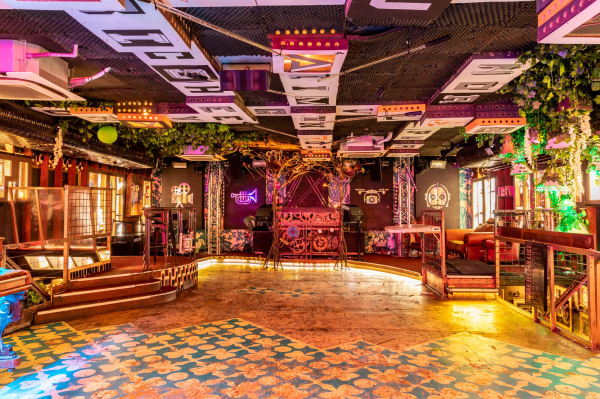 We needed to be mindful of authentically representing the feel of our old venue despite the different architecture and dynamics that were presented, ensuring the new design appealed to existing clientele as well as visitors, artists and promoters. Spatial flow between the two levels and respective areas was a key consideration, particularly throughout different times of the day/night and varied offerings. 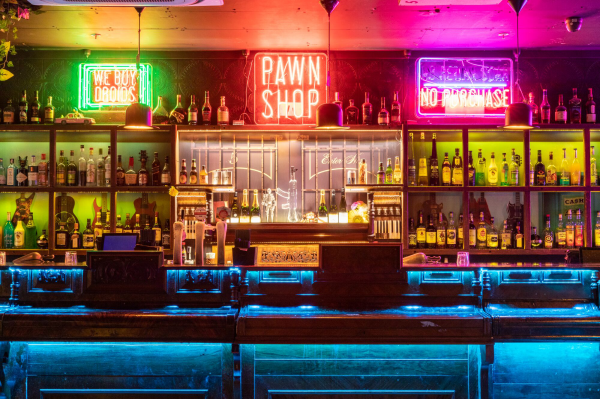 Downstairs greets the customer with experiential activations; a watch shop with personalised engraving, sneaker wall, a drink dispensing vending machine robot and booths within two custom-built Victorian trams that create focused conversation space. Memories embedded in the timber of the up-cycled piano bar facade stirs mood while an automated carousel bar visually engages the room. Upstairs the walls are lined with cages of curated pawn items for sale, from Star Wars memorabilia to tongue-in-cheek adult items and a below-line musical theme with instruments as used as textures, violins, electric guitars positioned in cabinets, 'trumpet tree' installations either side of the DJ booth and a custom built organ that makes a cocktail as you play the keys. Several perspectives were carefully considered in the process; flexibility, customer experience, operations, dynamics safety, entertainment and comfort all needed to work cohesively. 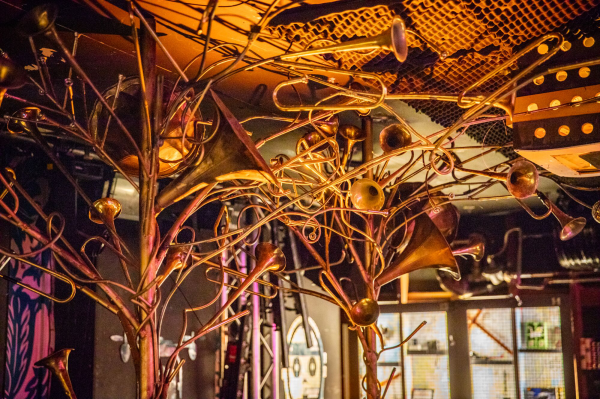 The highly conceptual, interactive and functional nature of the project required customisation at almost every touch point, with film set designers and local artists engaged to execute key elements where original objects (like actual trams) couldn't work due to issues around weight and cost. Lighting was critical to the proposition. 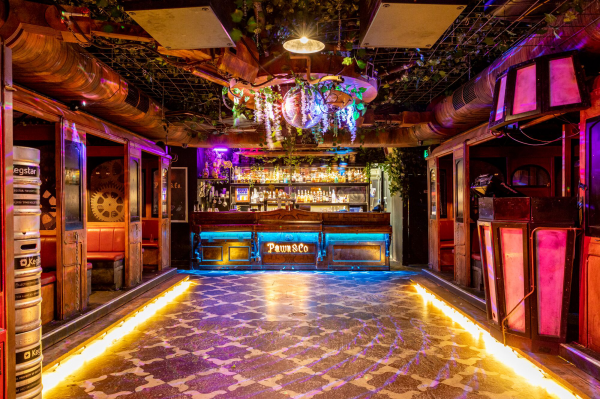 The challenge here was to create adaptable solutions that highlighted the cabinets and activations whether the offering is a bar, nightclub or function. Core strength of the concept lies in pre-loved materials and items. The implicit histories from owners-past create an energy that is unique to the venue. Existing building features and up-cycled materials were used wherever viable for organic feel throughout the design process, this philosophy is further applied to events, as our clientele are highly conscious of environmental impact.